Yup, you’re getting a new video from the KlezFactor vaults every day until we release our IndieGoGo campaign on Monday, June 1! What does that mean? It means lots of KlezFactor music! Today’s “blast from the past” goes all the way back to 2006. We played at the City of Toronto’s Earl Bales Park in three years back in the late oughts. 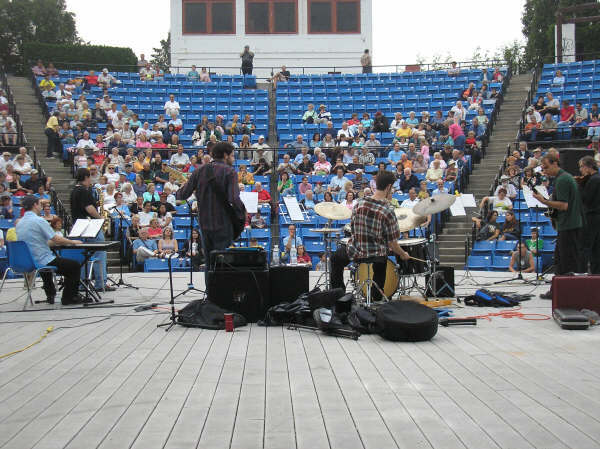 The first two years were outside at the Barry Zukerman Amphitheatre and this was one of those years! In this clip, we’re playing “Fun Tashlich,” the first track from our first album, The Golem of Bathurst Manor. In structure, our arrangement of this tune is based on the recording by the Klezmatics from their 1990 album Rhythm + Jews which opens with an amazing bass clarinet solo by David Krakauer. While the Klezmatics recording is far more Middle-Eastern flavoured, we decided to really bring the rock n’ roll and combine that with some modal jazz! While I’m playing alto saxophone in this clip, I actually played the saxophone solo at the start of the tune on the album cut on soprano saxophone. Find it on iTunes if you don’t own it already, or you can go to CD Baby and download it there (or get the whole album too)! The Klezmatics based their recording on the Naftule Brandwein tune “Fun Tashlach (Returning from the River)”, recorded in the late 1920s. Without further ado . . . the blast from 2006. Go to our Facebook page and like us there! ← Previous Previous post: The Vault Opens . . .